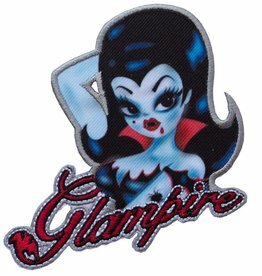 Glampire patch featuring artwork by Miss Fluff, sublimated patch with embroidered Glampire detail. 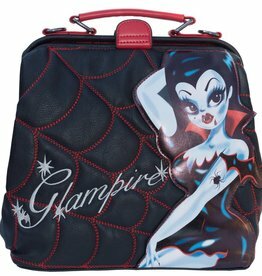 Size approx 3in h x 3in w.
No lurking in the shadows this Glampire is always in the spotlight! Designed exclusivley for kreepsville 666 by Miss Fluff. Poly Cotton Spandex tunic dress with raw edge necklne and Glampire motif on sleeve. Made after dusk in the USA.